An efficient inventory, procurement and supply chain management system facilitates a hospital to reduce operation costs, improve cash flow and ensure patient satisfaction. It can be a key differentiator for a hospital. 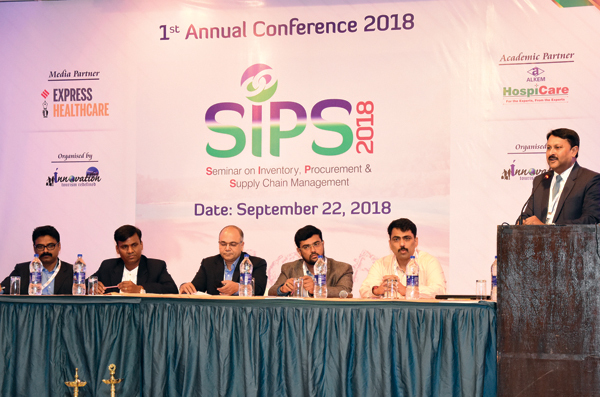 The first edition of the Seminar on Inventory, Procurement and Supply Chain Management was held in Goa on September 22, 2018 where discussions were held to provide a learning ground for inventory, procurement and supply chain managers. The seminar was organised by Innovation and Alkem Laboratories was the knowledge partner. Express Healthcare was the media partner for the seminar. Around 43 experts from healthcare organisations were present at the meeting. Sandip Dey, BU Head-Hospital Business, Alkem, inaugurated the seminar. He spoke about the role of supply chain and procurement as a success enabler for hospitals and the reason for Alkem to be part of this gathering. “There are many challenges that need to be addressed within the hospital supply chain system. Therefore, we felt the need to be part of this knowledge sharing meeting where ideas are exchanged and strategies can be developed on how we as a community can improve supply chain, procurement and inventory management within hospitals to ensure an organisations’ business success,” said Dey. Next, Sanjay Bajaj, Group Head Procurement – Rainbow Group of Hospitals, Hyderabad, spoke on the essence of inventory management in healthcare. He began by explaining that the primary focus on inventory management must be to ensure that all patient needs are met. “Inventory management can provide a benchmark against the performance of a hospital. 30 per cent of a company’s revenue is at stake inventory. It can be an effective tool in achieving a competitive advantage for the organisation. Keeping right levels of inventory management is crucial in order to meet patient commitment while minimising costs,” he expounded. This interesting talk was followed by a panel discussion on NPPA, DPCO and government scheme implication and outcomes. The panel had Edmon Paul, Parkway Group of Hospitals, Mumbai ; Naresh Agrawal, CEO and Procurement head Emami Frank Ross, Kolkata, Hazrat Ali, Head Procurement -Manipal Hospitals, Bangalore; Venkatesan, Sr GM supplychain management, HCG group of Hospitals, Bangalore and Ajay Menon, Procurement Head Fortis, Hospitals, Mumbai and was moderated by Sandip Dey, who discussed the impact of legal and ethical pricing strategies. N Venkatesan, Sr GM Supply chain Management HCG Group of Hospital, Bangalore, spoke on the challenges in procurement strategies. He brought to light the need for hospitals and pharma companies to look at QA/QC mechanisms. In his presentation, he highlighted that business intelligence is key to ensure best practices in procurement. The conference ended with an insightful panel discussion on Hospital Business 2025. The panellists were Jaiprakash Vastrad, Head Pharmacy Div, Sagar Hospitals Bangalore; Amrendra Singh Deo, GM-Commercial, Global Hospitals, Mumbai; Balaji Srinivasan, Chief Procurement, KDA Hospital, Mumbai; Vimal Sarin, Head of Pharmacy – Sahara Hospitals, Lucknow; Sandip Dey, BU Head Hospital Business, Alkem Lab. The panel was moderated by Raelene Kambli, Special Correspondent, Express Healthcare. Panellists in this discussion unanimously agreed that hospital pharmacies and supply chain can be a great enabler for business success and accessibility, affordability and assurance will be the key to business performance. The panellists also highlighted the need for hospitals to up their game in quality performance to ensure patient satisfaction and brand value. This programme was one of its kind which brought a lot many insights in the field of inventory, procurement and supply chain management. All the delegates were happy and delightful about the content of the programme and shared their urge for many such programmes in future.